Exporting products from a WooCommerce store to a CSV file becomes necessary at one point in time or another for multiple reasons. You can easily export all the products and product types (simple, variable, grouped, and external) in your WooCommerce store to a CSV file using the Product Import Export Plugin for WooCommerce. Exporting products to a CSV file is necessary if you want to migrate your products to another WooCommerce store in an efficient way. Exporting to CSV file can also be used to keep a backup of the products and the product data. And also, the exporting products of your WooCommerce store into a CSV file allows you to bulk edit the products in the store and then import the products back to the store to reflect the changes. To export WooCommerce products to CSV file, first, you need to purchase, install and activate Product Import Export Plugin in your WooCommerce store. The Plugin gives you a lot of control over the products that are exported to the CSV file. For example, if you only need a portion of the products to be exported in the CSV file, the offset and the limit fields in the export section help you to do just that. Also, you can export products that belong to a category or selected categories, or you can just export only certain product types etc. 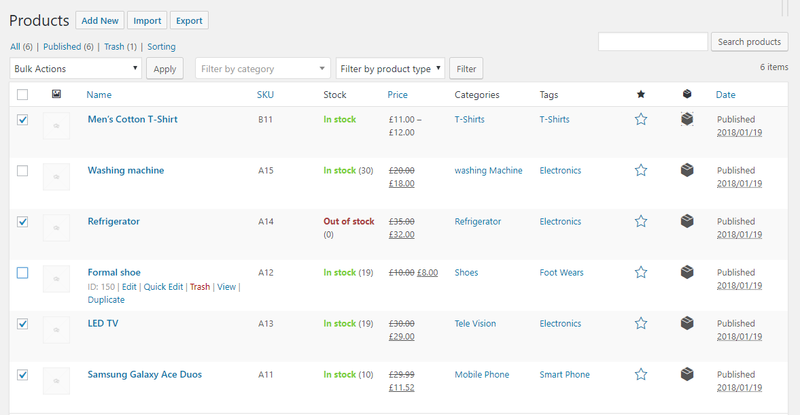 After installing and activating the plugin, on the sidebar under the WooCommerce menu, you can see Product Im-Ex. So, to export the products in your WooCommerce store, from your WooCommerce store admin side dashboard, go to WooCommerce > Product Im-Ex. This will take you to the Product Import Export plugin page. From the plugin page, on the Products tab, go to Export. This is the default page of the plugin. From this page, you can export all the products in your WooCommerce store into a CSV file. Offset: Here you can set the number of products to be skipped before exporting to the CSV file. For example, if your store has 100 products and if you give the offset value as 10, the first 10 products will be skipped before the exporting. The resulting CSV will have a total of 90 products. Limit: In this field, you can set the number of products that should be exported to the CSV file. So, if the value in the field is 50, only 50 products will be exported to the resulting CSV. The Offset and Limit field can thus be used to export a portion of the products. For example, if you need to export 50 products after skipping the first 10 products then what you need to do is give the value of 10 in the Offset field and 50 in the limit field. This will export product with the product number 11 to 60 in the resulting CSV. Product Categories: In this field, you can specify which categories of products you want to export in the CSV. The products belonging only those categories will be exported in the resulting CSV. Product Types: This field allows you to filter the product types (simple, variable. grouped, and external) of the products that are to be exported to the CSV. Sort Columns: This field allows you to enter the column name by which you can sort the products in the CSV file. You can sort the products by more than one column name by specifying the name of the columns separated by a comma (,). Delimiter: This field help you set the delimiter by which the values in the CSV will be separated. The default delimiter for the CSV file is a comma (,), but you can also use other special characters like /, ” “, |, @, and so on as a delimiter. Save the Export Mapping: If you wish to save the mapping file for exporting, you can enter the name of the export mapping file in this field. Otherwise, you can leave this field empty. Include hidden metadata: This field will allow you to include the hidden product metadata in the exported CSV file. Export Children SKU of the Grouped Product: By enabling this checkbox, you can link the parent and child products of the store using the SKU of the parent product instead of the product ID of the parent product. Convert Shortcodes to HTML: Enabling this checkbox will allow you to convert the shortcodes to HTML in the resulting CSV file. After the fields of the plugins have been configured according to the requirements, you can go ahead and click on Export Products. This will create a CSV file that will be downloaded to your local computer. Apart from exporting products from the CSV file, you can also export products from the products page on the admin side of the WooCommerce store. From the dashboard, go to the Products page. From the products page, select the products that you want to export. After you have selected the products that you want to export, go to Bulk Actions > Download Products as CSV and click Apply. This will export the products in the CSV and download the CSV file to your computer. In this way, you have more control over which products are exported and you can export products, not in a sequential order, but you have less control over how the CSV should be exported. Read more about importing and exporting products from your WooCommerce store using the Product import Export plugin in the documentation. IS there any way to export additional product fields? For example I added a field “NS ProductID” into the addition fields or More fields on the product. It does not show up as a field I can export or import. How can this be done? Please enable the option Include hidden metadata while exporting to export your custom fields/ additional metadata. So I exported my products but the data for each product is all in one cell. How do I fix this? Our plugin by default export the CSV keeping comma as delimiter whereas your CSV viewer may not be using the same. Either you may change the delimiter settings of your CSV viewer or export by specifying appropriate delimiter in the plugin settings. Try with a semicolon ; as the delimiter.